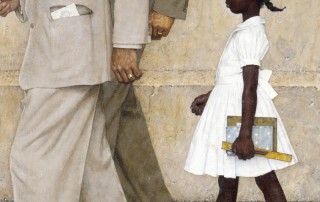 The value or significance of Norman Rockwell’s representations of the Civil Rights movement as sources of historical information. Students will gain an understanding of the events represented in The Problem We All Live With. 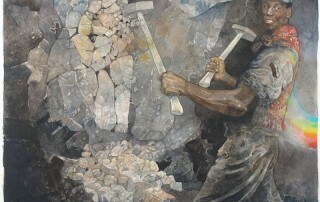 Students will develop critical thinking skills by analyzing different sources of visual information. Students will reflect on the subjective nature of historical information. 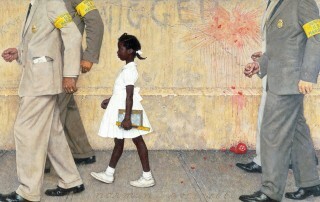 Discuss segregation and civil rights as you explore Rockwell’s “New Kids in The Neighborhood”. 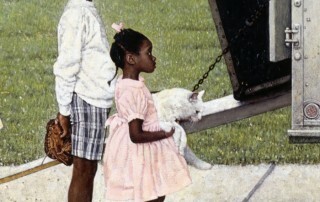 Painted in 1967, this illustration depicts suburban integration in Chicago’s Park Forrest community. As a vision of positive change and growing tolerance, the children appear as if they will soon play together. 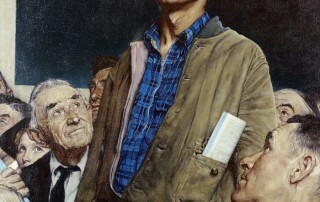 FREEDOM OF SPEECH (GRADES: 6-12) Explore voting rights as you investigate, Rockwell’s freedom of speech. Build writing skills, media literacy, and civic responsibility as you explore ways that Jerry Pinkney helped to diversify children’s literature. 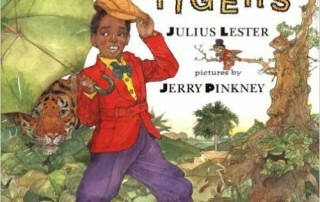 Build literacy skills and social responsibility as you explore ways that Jerry Pinkney helped to diversify children’s literature.